The Machine beats the Sportsbet Line. Mother and I always like to have a line bet riding on the Friday night game so it was disappointing to see The Machine suggesting no betting on this game. 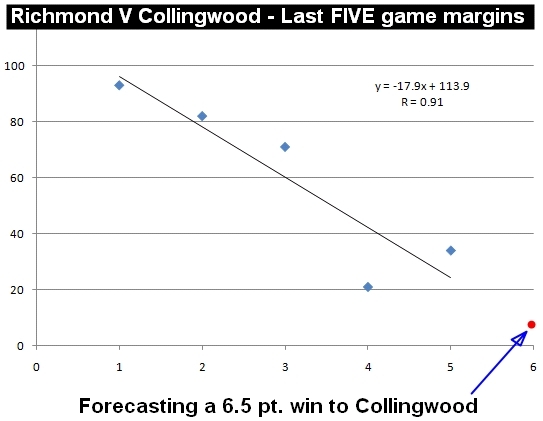 I decided to analyse this game a little further using some simple regression analysis in an attempt to find a bet; So it does appear that this Friday night game is not a good line betting option. It is interesting to note that the average Total Game Score over the past five encounters has been 184.2 points. Sportsbet is offering $1.88 for a Total Game Score of above 169.5 – Mother and I are on! Higgo should that be $4.20 profit? 3 Bets at $5 = $15 outlay, 2 wins at the line = $10 X $1.92 = $19.2 – outlay $15 = $4.2. Correct, post has been updated. Port and Crows look handy. Was keen on your fri night tota lpoints over but its a miserable day out there… Any thoughts on impact with the weather? Correct – post fixed …. backing LIONS at line against PORT. Weather is not factored into The Machine formula. Recall Cloke kicking 7 on Rance last year and Swan running riot. With Rance out, does Astbury get the job? Could be a big night for Cloke resulting in a decent total game points. This week the General Principle lost $1.90 to have a current bank $99.56. The Soreness Deviation continues to perform 4 bets for 4 wins in last two weeks. This week the Deviation's selections almost mirror that of the Machine. With the Deviation taking Sydney over North at the line. And the Hawks to cover the line, although i think that's what the Machine meant to say. Crouching should catching the movie 'Wendy Wu'. Lots of awesome fly kicks. Question Higgo, have you noticed in previous years whether sportsbets line (and the machines) accuracy increases as the year progresses with greater exposed form?